Eglin Air Force Base is one of the largest bases in the country, but visitors will want to head to one very specific area. The Air Force Armament Museum is a top attraction and a fun way to learn more about history, aircraft, and Florida as a whole. Lest you think it's all dusty exhibits, take a look at what you'll find within the museum. Before you even enter, you'll have the chance to see a collection of 29 actual planes, some of which were used in World War II or are among the fastest planes on the planet. Inside, there are cockpit simulators and some serious weapons. Kids and history buffs alike will find something to get excited about at the Air Force Armament Museum. Although the Emerald Coast Science Center might be geared toward kids, there is no denying that adults will love it too. The exhibits are well beyond standard science fair quality, and they are staggering to behold. You'll get to land a model plane in the middle of a wind tunnel, or you can use robotic arms to see how they work. Animals, hands-on experiments, and more keep visitors coming back time and again. If you're planning a trip for the adults, then don't miss Helen Back. This local favorite has their own dock, so feel free to motor on in for some of the best pizza around. Helen Back's menu offers sandwiches, salads, and delicious pizza. The nightlife and drinks are as popular as the food. If you picked up your double-decker pontoon boat from Adventure Marina, you can walk to Helen Back once you drop your boat off. You'll be just steps away, and you'll be able to share stories of your day on the water spotting dolphins, making a splash on the waterslides, and chilling out in Crab Island. One of the busiest, most popular and most exciting attractions in the area is the Gulfarium Marine Adventure Park. This theme park is part aquarium, part amusement park, and part animal sanctuary. It has a little something for everyone, and it is impossible not to fall in love with the marine animals while you're there. Watch the dolphins put on a show, snorkel with stingrays, touch a sea lion, and much more. There are all types of animals encounters that await you and your family. 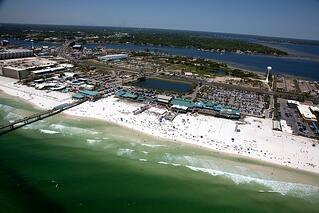 Halfway between Destin and Ft. Walton Beach, right on Okaloosa Island, is John C. Beasley Park. This is a picture perfect beach destination, and it is what many people imagine when they start planning Florida beach vacations. Two wooden pathways frame the entrance to the beach, which boasts pristine white sand and gorgeous dunes. Two big pavilions are ideal for picnics, and there are showers and restrooms. During the peak of summer, you can even rent chairs and umbrellas to upgrade your beach day in a big way. Don't leave Ft. Walton Beach without enjoying your very own double-decker pontoon boat charter. At Double Fun Watersports, we'll provide the pontoon boat that sets the stage for the perfect day on the water. The season ends October 31st, so don't miss your chance to get out on the water this year!